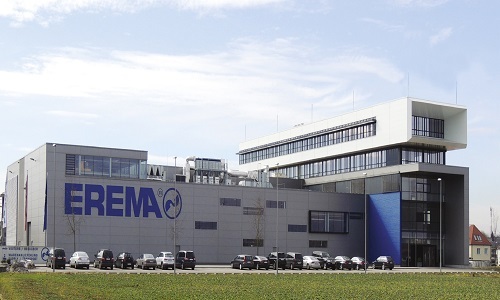 Ansfelden, Austria, 2 April 2013 – With annual sales in the region of 105 million euros EREMA can once again look back on what has been a very encouraging fiscal year. After record-breaking results in the previous financial year this outstanding result in a year of consolidation has made a successful contribution to the continuing growth of the company. The global market leader in plastic recycling systems headquartered in Austria has been able to increase its turnover continually by an average of 10 per cent over the last ten years. Consolidated group sales together with its subsidiaries EREMA North America Inc. in Ipswich, MA and 3S GmbH in Roitham near Gmunden from April 2012 to March 2013 reached around 117 million euros. According to Manfred Hackl, one of the two members of the managing board at EREMA, there are three reasons behind the continuing success and promising growth. To begin with, the production of plastics compared to the dramatically declining primary raw material resources continues to increase every year. This means that plastic is becoming increasingly significant as a valuable secondary raw material. The second factor is EREMA’s dynamic growth strategy, with the company headquarters constantly expanding from its own resources. And the third factor is the company’s dedication to its customers and the committed employees at EREMA who make a major contribution to the success of the number one in plastic recycling systems. This success stems primarily from the classic EREMA technology which continues to lead the way throughout the world as the leading standard. The heart of the EREMA systems is the combination of cutter/compactor and extruder which can be used for a wide variety of recycling tasks in both inhouse recycling and severely contaminated post-consumer waste. How dynamic the company is could also be seen in the last fiscal year with new product innovations such as COREMA® and the opening of the EREMA Customer Centre. The way has also been paved for the growth to continue at the same time: EREMA is expanding its company premises in Ansfelden near Linz. With an investment of 4.3 million euros two new floors have been added to the company headquarters, offering a total of 100 new workplaces for engineering, sales and after sales service. Staff will move in to the new 1,700 m² of office space in April 2013. The growth strategy is also supported by software thanks to the introduction of a new Enterprise Resource Planning (ERP) system. The new 2013/14 fiscal year also promises even more outstanding innovations from EREMA for the plastic recycling market which will be presented at the K 2013 trade fair. The countdown for a new dimension in plastic recycling systems has thus already begun.